Recently, my 15 year old daughter Emily has shown interest in nonprofit marketing and fundraising. In this special series of Nonprofit Answers episodes, you’ll learn all aspects of the fundraising process. In this episode, you will learn donor motivations and how your nonprofit presents an appeal or campaign to specific types of donors. You’ll start learning the foundations of donor psychology and how to motivate donors to give. Welcome to a special episode of Nonprofit Answers. This is one of many to come. My 15 year old daughter Emily has shown an interest in working in the nonprofit space, specifically in the fundraising area. 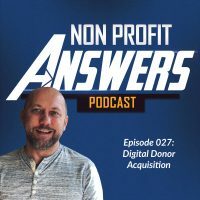 I’m going to take the next few episodes of nonprofit answers and dive deep into educational topics for people that are new to fundraising to explain how nonprofit fundraising works. And I thought what better way to help people understand fundraising than explain it in a way that I would explain it to Emily. This series of podcasts and articles is dedicated to her. In research circles, there’s a concept called the curse of knowledge. The curse of knowledge describes that once you know something, it takes a lot of effort for you to take a step back and to explain it in a way that a person who is not familiar with the topic can understand. In other words, once you know so much about something, you just assume other people know as much as you do or it becomes difficult for you to explain something at a basic level. Personally, the curse of knowledge strikes me when I’m preparing for a podcast episode. Am I using any jargon or concepts that listener may not understand? Am I assuming too much knowledge in a particular area? I don’t want to breach that line of creating podcast episodes that are too basic and don’t offer useful information, but I also don’t want to speak over someone’s head. Fundamentally, how do I teach a new fundraiser everything she needs to know about nonprofit fundraising and nonprofit marketing. In this case, I’m going to put myself in my daughter’s shoes and if I looked at my job from her perspective, what would she need to know? I’m going to teach her what I know about fundraising and marketing from a nonprofit perspective so that she can understand what my job entails and to see if it’s something that she’s interested in pursuing in the future. This series of podcast episodes, I’m going to teach fundraising to someone who’s new in the business. This doesn’t mean that if you’re an experienced fundraiser, you won’t get something out of this series, though you may find that you already know some of this information. My hope is that you’ll listen to these episodes and walk away with actionable tips to help you become a better fundraiser. I listened to a lot of different podcasts and for many of them, my goal is just that to walk away with something that improves my skills or my team skills or our marketing or fundraising to learn something that helps improve the work that we do at Food For The Hungry. I strongly believe you’ll learn something through this journey. Even if you know a topic, listen to this episode to discover a nugget of wisdom that I’ve gathered over the years or researched and you’ll be able to say that’s a great actionable tip that I can use with my team and something that I can use in my job right now. Today we’re going to start at the beginning. We’re going to talk about the donor. Why does a donor give? What is our relationship with her? What are her motivations? What does she want from us? What does she want to hear from us and what does she want to communicate to us? Let’s talk a little bit about traditional for profit marketing. In a traditional company, what’s the product? It’s kind of an easy answer, right? If we’re talking about, I don’t know, say a tool manufacturer that makes hammers, screwdrivers, those sorts of things. The product is just that, the hammer or the screwdriver, who is the customer, in other words, who pays? what can the answer’s kind of easy, right? It’s people like us. I’m going to go to a hardware store and I’m going to buy a hammer or a screwdriver. You and I are the customers. What about a non traditional for profit from a company like Facebook, who is the customer? You might say that you and I are the customers for Facebook. Just from a consumer standpoint of being on Facebook using the APP, connecting with our friends and family, but is that true? Let’s take a moment and provide a simple definition for our customer. The customer is the person who pays. In the case of Facebook, we don’t pay to use the APP or the website. We don’t give Facebook like 25 cents every time we click on the like button or a dollar to pay the connects to someone we already know. If we define the customer as someone who’s paying, who’s the customer in the case of something like Facebook. Facebook makes their money off of advertising. Who Pays for the advertising? Businesses, nonprofits, other people, that makes them the customer. If the ad buying businesses are the customers, what does it make us? That makes us the product. Why is this important for profit nonprofit? As a marketer, you must understand who the customer is. So what about in nonprofits? Who is the customer? Is it the people we serve? No, they’re not the ones that are paying or giving us the money. Who’s paying? It’s the donor. So the donor is the customer. Why do people buy a product? Let’s take an example again, like the manufacturer of tools. Why do you buy a hammer? Do you buy it so you can strike a nail into a wall? No, not really. You buy a hammer to hang something. Why do you buy a particular shirt? To keep warm, to look good to others, to send a message if it has a saying on it or maybe even just the brand of the shirt or perhaps you just buy it because you love the color. There’s lots of reasons people buy a shirt. We buy things to solve a problem. In the case of the Hammer, the problem is that we need to hang something on the wall and using a screwdriver to pound in a nail is just not as effective as using a hammer. In the case of the shirt, perhaps you buy a shirt because you like the color, but there are a variety of reasons or motivations for why people buy a shirt. You might buy a shirt because you just liked the way it looks, so when else might buy a shirt, because that particular brand lasts a long time, someone else might buy that shirt because they’ve just found that that shirt keeps them warm. Each reason why someone buys a shirt is solving a different pain point or a problem. That’s the fundamental reason people purchase a product to solve a problem or to relieve a pain. Why does someone donate to a nonprofit? We’ve already established that there’s a pain point to solve as a customer that you’re trying to solve something. What is that pain point? Why does someone want to give their hard earned dollars to a nonprofit that you don’t have the surface? Most the time you don’t receive something tangible in return, what is the problem that we’re trying to solve as a donor? Let’s explore what pain point we’re solving as a donor. When you solve a pain point, you create a customer. For the nonprofit, fulfilling this need creates a donor. People give for many reasons, so let’s explore a few of those. When we hit the reason why people give and that aligns our cause with their problem to solve, we receive a gift. I’m going to say that again. When we hit on the reason for why people give, like why an individual person would give and that is aligned with our cause and we align that with their problem to solve, we receive the gift. First. People give because they’re asked. That might seem like a silly reason, but if you look at survey results, a lot of people say the reason they give is because they’re asked. So a question I have for you is, are you asking enough? If you’re only sending quarterly appeals to your donors, are you asking enough? It’s their primary motivation is to give to your nonprofit, is to give because you asked. And you’re only asking them like four times a year, what are they going to do on those other months when they have an opportunity to give to something, but you’re not asking for their donation. I believe sometimes we worry that we’re bothering our donors. If all we did like send them appeals, we may be bothering them, but if you have healthy communication strategy that shows gratitude, shows impact of donations, then you may be actually appealing to little to your donor. If you’re solving a donor’s problem and making them feel joy by giving to your organization. Why would you rob them of that joy by not providing them opportunity for them to give. Second people give because others give. This is why peer to peer or crowdfunding is an effective tool for nonprofit fundraising campaigns. People have an internal motivation to join with peers, friends and family to give. People want to join and be a part of the team. Many people are also competitive. That describes me a little bit, couldn’t have a kind of a competition element. Then people want to give because they see their peers giving. A lot of times at dinner’s gatherings when you bring people together around the cause, there’ll be a competitive element and some people will give to be able to compete with one another. The friend Joe gave so they’ll call them to give to match Joe’s gift. Third, people give when others give that are in their own social class. Again, this is a great opportunity to employ the tool of event based fundraising as it allows you to bring together people of a certain social class. When people see others in their own social class giving, they’ll be motivated to give as well. It’s also why well known donors provide match for your fundraising campaigns why this will work really well for you. Because people look at that and they see other people giving that they know and they want to join with those people to give to your organization. You can use someone well known to create a matching campaign that will move people to give. Forth, giving makes us feel important. We want to be a part of the solution. When you’re nonprofit offers a solution, then they want to be part of that so they can know that their donation went to something good. They want to see their name in lights. They want to be known for caring. Again, event based marketing works really well because people want to be known and they want to feel important. Provide opportunities for people to be recognized for their gifts if they want recognition. this will give insight into which donors want to feel important with their gift and offering exclusive opportunities like a monthly teleconference with your president that reinforces value for those who want to feel valued and important. Fifth, people get because they want to be on the winning side. Many nonprofits are adept at presenting themselves as winners. Charity Water is phenomenal at showing and demonstrating that when you give them money, your donation as part of a winning solution, they do this by showing impact immediately to the donor. People who are motivated to be on the winning side, they want to sense that the nonprofit is winning. They don’t want to hear about that the nonprofit is struggling. They want to hear that the nonprofit is solving problems. This is an important point to dwell on. Some organizations that create fundraising appeals and they focus on the needs of the organization. For example, were $500,000 short in our operating budget this year and we need money to keep the lights on. When you present a fundraising appeal with this type of content, it sends the opposite message of what you intend. Donors don’t want to be part of a failing organization. Instead, write your appeal so they are focused on the needs of your beneficiaries. Focus on what they need instead of what your organization needs. Six, people give when they have a connection to a cause. As an example, if a donor’s mom had cancer, she may give to a cancer charity. If she grew up surrounded by dogs in her family, she may give to an animal shelter. If she played in an orchestra and her youth, she might be motivated to give to an orchestra. Writing appeals directed to people who have an affinity for your cause will convert those people to give. The connection doesn’t have to just be for the cars. The connection may be to a celebrity. People who feel a connection to a celebrity will give because the celebrity endorses your organization. The connection may also be to the rights your organization is fighting to defend. The connection may be that people just want someone more powerful to stand up for them. This is the primary reason people support the NRA, ACLU or political parties. These organizations receive donations because they are standing up for the rights that people feel connection with. Seventh, donors give because they believe it makes a difference. We live in a broken world and we hear these heartbreaking stories so we make a donation because we want to solve that problem. Sometimes we can even relate to someone in need. We may have had that situation in our youth and are in a better position now to donate. Hearing a story of a beneficiary brings back a memory of being in that situation and you want to help. Your organization should tell stories of impact to reinforce that donors make a difference. Position that donor is a hero of the stories as the one who is making an impact, the one changing a life. Another common reason people give is they have religious leanings. Several studies have shown that people who have religious leanings give more than nonreligious households. So there is a study last year and 62% of religious households gave to a charity while 46% of non religious households did. On average, the religious households gave $1,590 annually while the non religious households gave $695 annually. It’s more than double. Religious organizations also received more funding. In 2016, religious institution received nearly $123,000,000,000. While the next closest nonprofit sector education received just shy of $60,000,000,000. Even if you’re not a religious nonprofit, knowing that people who consider themselves religious give more that provides you an opportunity to focus appeals on a receptive audience. Some people get because they’re offered a premium, like a bag, a DVD, tickets to an event, exclusive access to someone or something. Premiums are a powerful way that many nonprofits use to raise funds. This place to a feeling of reciprocity. You gave me something so I need to give you something back. People feel unnatural need to give back when they receive a gift. It can be a strong motivator. Many nonprofits find these donors will often only respond to premium motivated gifts, meaning gifts that you have a premium attached to, so there’ll be an ongoing need to offer premiums to keep these donors giving. 10th, some people are motivated by a tax write off. For many this is only a secondary motivation. For that reason, I often advise nonprofits to not use this as their primary lead, as fewer and fewer people are getting only for the tax write off. For a lot of people, it’s just a tertiary benefit to giving. Let’s pause for a moment and reflect on these 10 reasons why people give. If we peel them back a layer, many of them have an underlying reason why people give because it makes them feel good. For many donors, giving makes them feel good. When they feel good, they want to give more. When you develop your appeals, are you focusing on how it will make the reader feel? Are your appeals giving people joy? It doesn’t have to make them happy. Happiness and joy are two different emotions. Instead, do people feel good when they give to your organization? Do they feel like they made a wise investment? Why should we care about why people give? Why should we care about why people give? Understanding the motivation helps us prepare a fundraising appeal that speaks to the donor’s heart. Do you want to create appeals that speak to the reason why your donors give? Now, of cause comes to an obvious question, right? How do I write an appeal that targets one or more of these reasons? We need to create a persona for each type of donor who gives to the organization. The persona, it’s a picture of someone who best represents the type of donor. When you create a persona, you’re creating a representation of the donor that you want to visualize when you’re writing an appeal. The persona helps us assign a reason to a person that we write to in order to provide a pain point so that we can connect them to a cause. By identifying the reason why the persona gives, you’ll write effective appeals that motivate people to give. So how do we create a persona? Since the persona is a representation of a particular type of donor, you need to paint a realistic picture of who the donor is. There are several ways to take your donor database and create a good representation of who the donor is. You can use survey data about your donors. Every couple of years we perform a representative survey of our general donors and a different one for our child sponsors. This provides data for us to paint a good picture of who these different types of donors are. Another method that we use is to review analytics data from third party tools we use. Think of like Google analytics or Facebook insights they provide a snapshot of who the audience is. With Facebook insights you can even upload a list of donors and get an idea of who makes up that audience. There are other third party tools that can help identify who your audience is. What kind of data points are we identifying? What information is useful to create a persona? You’ll identify data such as gender, age, education, marital status, kids or no kids, kids at home, kids not at home, home ownership, hobbies, geographic location, religion, likes, dislikes, music choices, TV shows, books. I could go on and on. We want to be as descriptive as possible to really identify what this person looks like, what a typical donor looks like. You’re keeping good to go as far as to name your donor. For most nonprofits, you will have multiple personas to write. Different donors respond to appeals for different reasons. A major donor is not the same as a monthly donor who is not the same as the general male donor. These people respond differently to appeals and you should message to each of them differently. Now, I’m going to read a couple example personas we used to use them at Food For The Hungry a couple of years ago. They’re a bit dated, but they give you a good example of how to describe your donor audience. The first person that is Michelle and Michelle is a typical child sponsor. She’s getting monthly towards supporting a child in a child sponsorship program. She’s Caucasian, Christian woman between the ages of 40 and 50. She’s married and has children living at home. She lives close to a metropolitan area. She may use child sponsorship as a way to teach her children about different cultures and to instill Christian values at charity. She seeks truth as a countermeasure to what she considers the height of empty marketing promises, and because of this is drawn to causes more than campaigns. It may still be evolving in her position on social values. She is driven by a quest for security and balance between work and home. She’s comfortable using the Internet for making purchases and for social interaction. She uses child sponsorship as a way to model Christian values to our children and to instill the Christian value of charity. She uses social media as a way to express her opinions about the causes that she cares about. She shares her passion with others, whether it’s in our living room or online. Communication to her should speak directly to her, succinctly stating the benefits to her and her family for taking action steps requested by, in this case, Food For The Hungry. This persona describes a monthly donor that we use to produce content to target this particular segment. Now I’m going to read to you a persona for Betty who is our typical direct mail donor. She is a Caucasian Christian woman who is 65 or older. She may be married or widowed and living on a fixed income. She is civic minded and will sacrifice for the greater good. She feels obligated by God to spread the Gospel message and to give at least 10% of her income to charity. She uncomfortable with the Internet but may use it minimally to keep up with friends and family through social media. She most likely will not give online, but she may go online to find out more information about things that interest her. She may be swayed by those who use strong need voices and appreciates the opportunity to engage in a campaign with an organization she is familiar with and trust. If she has wealth, she may be a plain giving prospect. Communications to her need to be clear and speak of her contribution to the greater good. At Food For The Hungry we have six or so different personas to describe different audiences at different types of donors. You’re likely to create multiple personas to describe different segments of your donor database. One key thing to keep in mind when you create your persona, the persona is a picture of who your donor is, not who you want your donor to be. This isn’t an aspirational profile of who you want your donor to be. You may want your donor to be a 28 year old college educated, professional woman, but you may end up looking at your file and discovering your donor is a 68 year old man. You may want your donor be something that is not, that is not the point of the persona. The persona is to describe who your donor actually is. So how do I use these personas? As you write appeals and communicate with your donors, use the persona as a guide. As you communicate with that as like it’s that one person, imagine that you’re talking to a real person. Person to person communication is the most effective way to reach the heart of your donor. You should literally picture this person in your mind as you’re writing. As an example, as I record this podcast episode, I’m picturing a development director at a medium sized nonprofit who wants to grow in her fundraising knowledge. As you write to that one person that described that single persona, you will end up capturing a much wider audience. Even though you’re communicating with a single person, a much larger audience will relate to what you’re communicating and understand and respond. Surveys frequently inform us that donors are looking for more impact. Donors want better and deeper relationships. They want community, they want hands on experiences, and they want more ways to get involved. This is both a challenge and an opportunity for your nonprofit. How do we do all that? How do we fundraise to a mass audience while creating deep relationships and community and give people hands on experiences? In the coming weeks, we’re going to explore how to build deeper relationships with our donors as we learned nonprofit marketing and fundraising. In the next episode, we’re going to dig deep into the psychology of giving, we’ll learn the internal motivations for why people give and how you should communicate with donors. It’s one of the best episodes yet, and I know you’re going to get a lot out of it. Thanks so much for joining me on this special episode of nonprofit answers. Please stay tuned as we go through the next couple of weeks and learn different aspects of nonprofit marketing and fundraising as I would explain them to my 15 year old daughter Emily. Thanks again.